If he comes around, don’t miss him. The show is golden. The music soars. John Jorgenson, known as The U.S. Ambassador of Gypsy Jazz, is setting fire to stages across the country with his Quintet. John Jorgenson is performing with Chris Hillman, Herb Pedersen and Bill Bryson at the Sellersville Theatre, in Sellersville, PA on April 26, 2013. Jorgenson has earned a reputation as a world-class musician and guitarist and has collaborated with the likes of Elton John, Luciano Pavarotti, Bonnie Raitt and Bob Dylan. Touring in support of two new releases, this latest creative cycle sees this legendary musician exploring new elements of world music, bluegrass, rock and classical as Jorgenson continues to expand his range of gypsy jazz, captivating and enlightening fellow musicians and listeners along the way. One Stolen Night, Jorgenson’s first of two new releases, was the second album credited to the John Jorgenson Quintet, following up on the Billboard Jazz chart success of Ultraspontane. The One Stolen Night collection contains a mix of standards and new compositions, with plenty of clarinet and swing, plus a vocal and the addition of the Greek bouzouki into the Quintet’s instrumentation. The Quintet recorded all of the tracks in two days using minimal production, resulting in a “live in the studio” sound that is warm, rich and so crisp that it envelops listeners in a warm, intimate private concert experience. The album features a driving rhythm section throughout as Jorgenson creates a classic gypsy jazz feel while pushing the boundaries with his arrangements and melodic content. “Red on Red” opens the album with fanfare and Django-inspired minor key swing, while “Mediterranean Blues” highlights a fiery jam session between violin and guitar. The title track, “One Stolen Night,” presents a captivating melody and showcases the enchanting sound of the bouzouki. Throughout the album the John Jorgenson Quintet creates a unique musical experience that equally enthralls the most discerning and the casual music fan with a sound that is all at once dynamic, romantic, driving, melodic and accessible. Jorgenson’s second new album offering is Istiqbal Gathering, the culmination of a long relationship between Jorgenson and Paul Gambill, conductor of Orchestra Nashville. Recorded live at Ocean Way Studios in Nashville and the Schermerhorn Symphony Center, Jorgenson and Gambill brought together a world-class team of musicians and collaborators to create the first collection of music specifically composed and recorded for gypsy jazz guitar and orchestra. Jorgenson’s brilliant guitar work leads the way, supported by the progressive and dynamic Orchestra Nashville. “Concerto Glasso” and “Istiqbal Gathering” feature a full orchestra, the latter showcasing the breathtaking talents of Alexander Fedoriouk on cimbalom and David Davidson on violin. “Dieter’s Lounge” and “Groove in the Louvre” feature the unexpected blend of string orchestra along with the GRAMMY award-winning Turtle Island Quartet. The combination is a groundbreaking album full of soaring melodies and driving rhythms. It is utterly one of a kind. 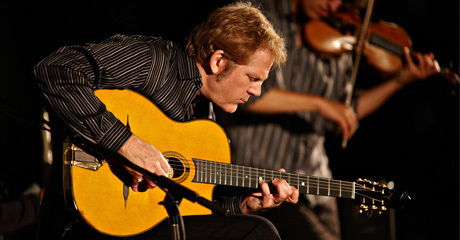 The John Jorgenson Quintet is the only American act to ever headline the prestigious Django Reinhardt Memorial Festival in France, and has been featured at other “Djangofests” in the U.S., UK, Germany and Canada. For the films Gattica and Head in the Clouds Jorgenson was tapped to recreate Django’s music, and in the latter he even appeared onscreen as Django with stars Charlize Theron and Penelope Cruz. Despite the levels of success Jorgenson has already attained, the acclaimed musician has no intention of taking it easy any time soon. Building on the legacy of Reinhardt, Jorgenson continues to expand the popularity of his beloved gypsy jazz by offering listeners an exotic yet familiar sound to which they can relate. Continuing his legendary career with his 2013 tour, we can expect Jorgenson to take gypsy jazz to new heights for many years to come.